What a waste of money? Isn't about time this project was knocked on the head? £700,000 (plus a fraction of the money that the bridge would cost) could provide a shuttle bus service to the rail station and hospital which would provide a service for all of the residents of Silsden, not just for the people that have to, or choose to, walk to and from the station. The service could be up and running very quickly. Has anyone bothered to find out why these people walk to and from the station and where they live in Silsden? A flat rate subsidised bus service could meet trains, or passengers would only have a minimal wait for a bus and the bus could serve both sides of the station. There is a route to get to the Leeds direction of the train line which a hopper bus could use. A shuttle bus could pick up passengers from all of Silsden and deliver them to the station and home dry. A bridge cannot serve both sides of the station easily, you will either have to go up or down a level (steps or steep ramp) before you start your journey, or when you return, ie there is no way to cross over the line without going up / down some steps. It is human nature to take the easiest and shortest route. If a footbridge is built passengers will continue risking crossing the A629 as they do now. The bridge will be a white elephant. I dont agree with it.Something should have been provided at build stage. If it ever gets built a lot if not most will still cross the road.It will no doubt be a long winding slope both sides and people will still risk the road. A bus service connecting with trains makes common sense and the fare should be included in the train fare. The usual catchment area for people to walk to the station is 800m and even the new site on Belton Road is outside this. Public Transport is the way forward. A simple traditional foot bridge with steps would suffice for the majority of people who walk. However the footpath over the river bridge means to access the station a long one over the round-a-bout would be needed. Alternatively reduce the pavement width on one side of the rive bridge and increase the other and build a simpler bridge that side. I suspect in this era of inclusivenss any bridge has to cater for all possibilities. This increases the cost substancially so making the whole concept a wate of time. How many accidents have there been involving pedestrians crossing the dual carriageway in the last 25 years? How many people of restricted mobility, possibly requiring an aid regularly use that route to the station or Steeton? There is only one possibility of a crossing and as i have always stated it will be an underpass. The feasibility study for a bridge, pushed forward by our councillors and the TC and supported by many of you, is a complete waste of public money and should never have been commissioned as an individual project. It should have always been a feasibility study to find the best possible solution, financially and/or physically. That solution i am without doubt would always arise at an underpass. There are many obvious and pragmatic reasons for this. 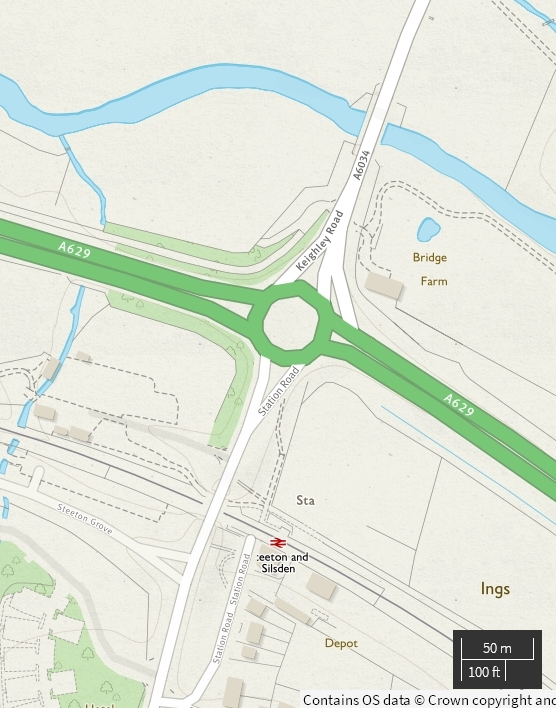 According to crashmap there have been 4 pedestrian related incidents at or around the roundabout in 19 years. 1 in 1999, 2 in 2003, all classed as slight, and one serious in 2011. If it doesn't go to both sides of the platform what use is it, human nature says if it's not convenient it wont get used. Why to people use shortcuts? Put the money to good use and subsidise a shuttle bus (or two) which will serve the whole population of Silsden (and Steeton). And in answer to this question, did your own "website" not conduct a so called survey regarding access to the station. The survey title was Cycle Path to Steeton Station - nothing to do walking to the station, but more about safe access. .... AND although a bridge was suggested by the respondents there wasn't an alternative method suggested at the time, and there was no consideration of the cost or the feasibility. You are quite correct in saying I don't walk to the station I consider it too far to walk from where I live, and I don't use the train that often. When I do use the train I don't want to walk through rain, hail and sun and cross a busy road, or dodge cars parked on the pavement. A bridge would not benefit me but it would only benefit the 100 or so that like to walk. However, the proposal I made for a shuttle bus would benefit the whole population of Silsden, delivering them to their destination safely, dry and not frazzled. Shuttle bus a brilliant idea  Serves a broader range of user. shame the 7 seater taxi could`nt meet the leeds and bfd trains,leaving silsden to take people to get trains and come back with people off the trains. Your all missing the point! A shuttle bus may be okay for those who can’t or dont want to walk but that does not resolve the dangerous situation of crossing the roundabout for those who want to walk and have the exercise to and from the station! Furthermore it was only recently (a few days ago) reported about the decline in bus services due to lack of funding and users. The only statutory requirement is to provide free bus travel for over 65’s! if Jackson’s are reading this or someone want to ‘enterprise’ maybe their is an opening for a shuttle bus, after all the station is supposed to be turned into a ‘travel’ hub! Still the pedestrian situation what this thread is primarily about needs resolution and the only way is for a simple underpass. As usual, nobody appears to have a valid argument not look at this option. There are lots of other places people could walk if they want the exercise. Get a bus to Steeton Top & walk back down? have the bus drop you over the river bridge & walk the rest of the way? Walk on the canal to Keighley and get the train there if you're that determined, it's lovely & clean now it's all been re-surfaced. The main difficulty using the service busses is that they are not reliable, The .02 and .32 minutes past from Elliot street should be perfect to catch the Bradford service, but as it is often late by as much as 8 minutes the distance from the bus stop to the station plus the time taken to purchase a ticket , makes it difficult if not impossible. An alternative "Grand Scheme" for the few that can walk / wish to walk to the station. Pity about the rest of us that live too far from the station to walk. I sympathise with those that want to walk and this idea may be better than a bridge but it is still a solution for the minority rather than the majority that have to use the station. The money required for this and the bridge scheme could be much better used by a subsidised shuttle bus which would serve all of Silsden's residents. Thank about that when it's throwing it down with horizontal rain. What? ?...You do not live too far to walk to the station..remember the more you exercise the easier it becomes! Have you also thought about moving closer if your finding walking a real problem..The Barratt Houses perhaps? There is a perfectly good bus service in operation ..its called the Keighley bus..though i admit fares could be cheaper! Think your getting confused..the scheme is for a safe crossing of the A629 not a pensioners day trip! Anyhow all public transport should be cheap..but then these days its not really public transport as its run by private companies wanting to make big profit! CY You are being rude and we all have a point of view and I believe a subsidised shuttle bus service (running every 15 minutes in peak times) would benefit ALL the residents of Silsden. It would be able to collect/deliver to BOTH sides of the station and go onto Airedale and up to Cringles. It could be up and running in months, and scheme to cross the A629 whether it's a bridge or a underpass will take years to argue about and years to build. There is £600,000 waiting to be wasted on a feasibility scheme before any thing is done. Pigs will fly before a bridge or an underpass is built. Yes i am being rude because you have utterly missed the point of a crossing! The crossing is to save lives, because people are putting there lives at risk crossing the A629. A shuttle bus does not save lives! It would only serve a minority itself..because as you know very few people want to ride on a bus (for lots of social or anti-social reasons). Many want to spend time by themselves walking or alone in a car! Many people choose to walk because it is good exercise for them prior to getting a train to work. It may indeed be there only form of exercise a day. Furthermore given that trains themselves are expensive to ride on an additional fare (no matter how small) is a choice many cannot afford to do. CY so where are your survey results to prove your point? Peter I have no reason to have argument with you..as you have already lost your own argument by confusing two different objectives! However..you might just want to traipse through many of the questions and answers of the 2007 or 2012 survey posted on this website to find some answers to your questions. One example you might find in the answers or general comments sections of the surveys by the public is NO mention of a shuttle bus or otherwise being required. However you might find statistics in the 2012 survey like out of 1,102 answered surveys, 142 people said (in the general comments section) crossing the A629 to the station was a danger! Regarding bus and car usage I would think by consensus (and likely generally available statistics) that it is pretty clear that people prefer cars and the own personal space that provides. May be we should both carry out a survey together and get to the bottom of it? My preferred option would be a monorail. High enough to cross canal, road, river and flood plain. Also able to provide access to both platforms. No need to dig up roads. OK, a pie in the sky daft idea, not technically by the way and probably not much more expensive than the gold plated proposals.